The Ambulance Americaine was organized in 1914 by a Parisian colony of wealthy Americans. Their goal was to provide health care relief for casualties from all nations. The French government offered an unfinished high school, the Lycée Pasteur, a spacious structure in Neuilly-sur-Seine (a northwest suburb of Paris). The Ambulance financed its supplies and work solely through private sponsorship. Many Americans who could afford it (or get sponsorship from philanthropists) volunteered as nursing aides, ambulance drivers and technicians. Nurses and surgeons left behind their civilian duties in the United States to serve – among them, alumni of Johns Hopkins University’s School of Medicine and the Johns Hopkins Hospital Training School for Nurses. 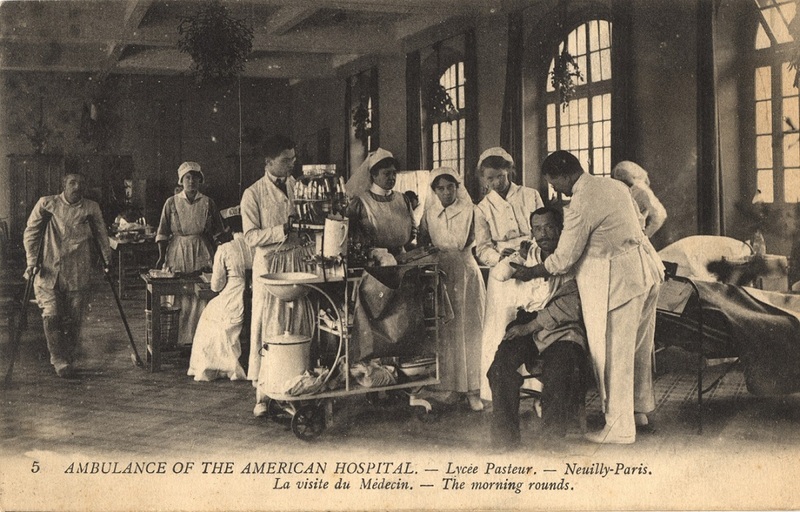 Initiatives like the Ambulance Americaine, in spite of their professed neutrality, were not without controversy. In the winter of 1914, Dr. George Crile of Western Reserve Medical School and Dr. Harvey Cushing of Harvard became the architects of the Ambulance Americaine’s surgical department. In order to secure a steady supply of well-trained staff, they invited top American medical schools to participate in a three-month rotation service. Harvard, Western Reserve, University of Pennsylvania, Northwestern and Washington University agreed to serve in this capacity. One invitee did not. The Johns Hopkins Hospital declined, ostensibly out of concern for both the impact on the hospital in Baltimore and its image in the eyes of those still wary about US entanglements. As an institution, Hopkins would not engage in any official capacity until two years later with the 1916 organization of a reserve unit, Base Hospital No. 18. By then, President Wilson and the US Army Medical Department were making preparations for America’s inevitable entry.